Inventive ways that campuses have deepened engagement. To end sexual and intimate partner violence, we must work to make change on individual, relationship, community, and societal levels. That means, for example, changing how individuals think, how people relate to one another, how communities respond to violence, and how society values healthy over controlling behaviors. 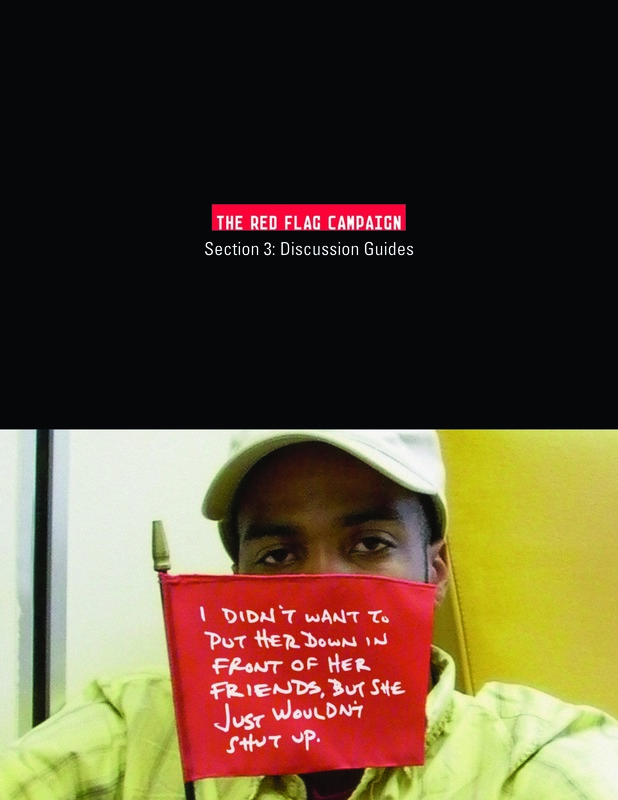 No one campaign will solve the problem, but The Red Flag Campaign can be a helpful tool in changing individual attitudes and behaviors, helping people learn about healthier ways to relate to one another, and shifting the social norms of a campus or community into one that is less tolerant of abusive actions and more invested in establishing healthy norms. We're passing along a few of The Red Flag Campaign success stories that campuses across the U.S. have shared with us. Learn more about the inventive ideas from schools that have engaged their communities in ending sexual violence, dating violence, and stalking on campus. Display red flags in a large grouping in a prominent area on your campus one week prior to posting posters (e.g. in front of dining hall, student union, etc). Distribute flags to influential people on campus and ask them to attach flags to their backpacks, tape them to their cars, or attach them to their bicycles for the entire length of the campaign! Partner with athletic teams to create banners, carry flags, lead effective bystander workshops, promote healthy relationship messaging. Plan a "wear red day" for a major game, give out prizes. The Red Flag Campaign scroll pens roll out to reveal characteristics of healthy relationships on one side and Red Flag Campaign website on the other. People LOVE these pens! Give them out as prizes for attending an event, completing an evaluation of your Red Flag Campaign-related programming...or just give them out to brighten someone’s day. Partner with your community Sexual & Domestic Violence Agency to co-sponsor a training for resident advisors and peer educators on how to spot and respond to red flags. 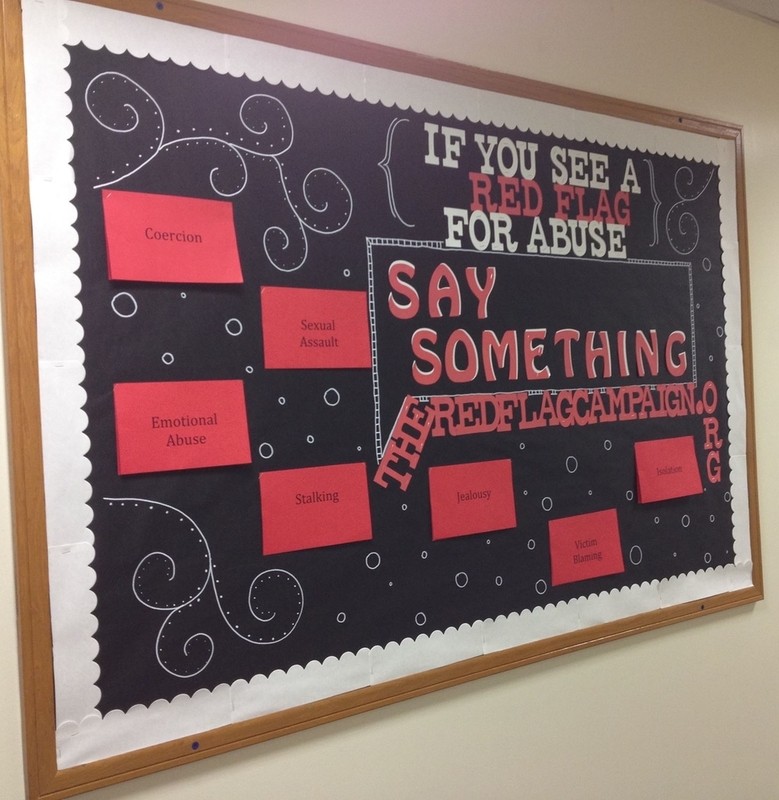 Hold a bulletin board contest for the most impactful, engaging Red Flag Campaign bulletin board. Engage student leaders from all groups to carry the message of effective bystander intervention and the importance of promoting healthy relationships. Offer blank flags and white or gold Sharpie pens for students to create their own flags (about warning signs or healthy relationships) to post around campus. Could you use a little help letting the campus community know about an upcoming panel discussion, speak-out, or movie night? Partner with your communications/media department to help bolster your marketing. Changing cultural norms requires investment from everyone on campus. Amplify your message by asking student groups to create giant banners (in this case, a queen-sized bedsheet) and hang from main campus buildings. Order Red Flag Campaign t-shirts to thank your campaign organizers for their hard work; ask them to wear their t-shirts at all Red Flag Campaign-related events to make it clear whom students can ask for help. Note: Red Flag Campaign t-shirts available at our online store are printed on front only. campus with a note about why it’s important to say something when you see a red flag for dating violence. If you need extra flags, you may order them here. Invite student organizations and clubs to the table to plan and launch The Red Flag Campaign on your campus. Student leadership builds buy-in, which results in a more effective campaign. Expand your messaging off campus. 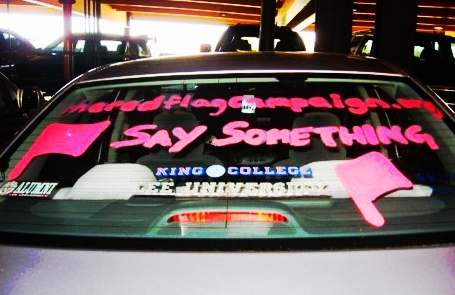 Use washable paint to add healthy relationships and bystander intervention messaging to student and staff cars. This is a particularly great idea for schools with a primarily commuter population. Remember to ask for consent first! Use the graphics provided on the Campus Planning Guide CD to develop announcements for Red Flag Campaign programming. Distribute to all campus electronic bulletin boards and social media. Use social media to establish a #healthyrelationships contest. Ask students, staff, and faculty to describe what makes their relationship a #healthyrelationship and tag your office. Add random drawings for giveaways to encourage participation and spread health promotion. Plan and create a #redflagcampaign or #friendssaysomething float in the homecoming parade or other big event. Ask student leaders to create and carry the banner. Establish a hashtag for your school's campaign (ex. #JMUredflag) to collect and share your school's Red Flag Campaign social media posts via #tagboard or Storify. Remember to use #redflagcampaign as well to connect the the national conversation. 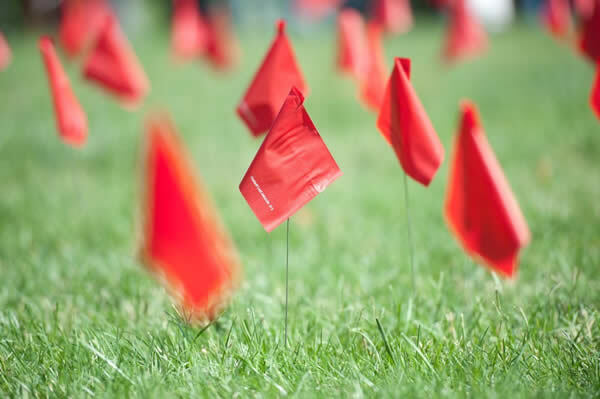 Join the official Red Flag Campaign Facebook page and encourage students and staff to post your campus’ activities and successes to share with other campuses. 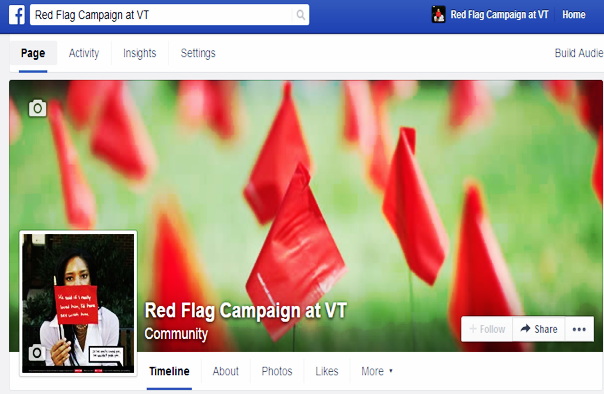 Create a social networking page for your campus’ Red Flag Campaign to advertise Red Flag events. Call your page "The Red Flag Campaign at (your school). Encourage students to add the page to their friends lists. Send friends list invitations to students. The Red Flag Campaign Campus Planning Guide features graphics files and button templates for your school to create your own giveaways. Use these as incentives to participate in programming, as thanks for student organizers, or just to spread your message. Ending sexual and dating violence will require changing cultural norms as well as individual behavior. Ask your community-based Sexual and Domestic Violence Agency to co-facilitate workshops on campus about the hallmarks of healthy relationships, how to spot red flags, and how to be an effective bystander. Discussion guides for these topics are included in The Red Flag Campaign Campus Planning Guide.